Modular Cranes are premium overhead crane manufacturers and installers. We are dedicated to providing our clients with the best crane systems to meet your specific needs and requirements. With over 20 years of experience in providing high-quality lifting equipment to various industries across Australia, we have constantly confirmed our commitment to supplying the best overhead crane systems Australia has available. We understand industrial operational environments and work closely with you to ensure the specific requirements of your site will be met. Modular Cranes is one of Australia’s leading overhead crane manufacturers and suppliers, offering the flexibility of modular component packages that cover an entire load range up to 100 tonnes. Our range can be easily adapted to suit any factory shape or application. These cranes are often utilised for lifting materials and products during the manufacturing process and we understand the importance of reliability, durability, and safety as part of the operational performance of your equipment. 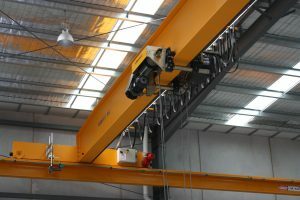 Overhead cranes are operated remotely from the ground by a hard-wired pendant or radio control fixed to the cranes. To move extremely heavy or bulky loads in a factory or workshop, an overhead crane (also called an industrial crane, crane, or overhead traveling crane) is a machine that lifts, lowers and moves a load horizontally. There are three different types of overhead crane to suit different types of buildings and workloads. Find out more about these types below. Alternatively, contact us by calling 1300 663 8527 today for more information. Single Girder Cranes are typically the most economical choice for light to medium duty bridge cranes. Single Girder cranes are highly efficient cranes that are built for cost saving, low maintenance and are often used in small spaces. Generally a lot lighter than a top running system, under hung crane runways allows for more versatility usability. Underhung runways can be ceiling mounted because of being dramatically lighter. Double Girder Bridge Cranes are most frequently used where capacities over 10 tons and/or spans of over 20m. The main structure of crane is composed of boxed steel with two beams or profiled ones with travelling motorized carriages. Open winch hoists are designed to operate in tough, arduous conditions with high frequency of switching operations. They can be rated for high duty classifications, incorporate fast lifting speeds and/or give extensive lifting heights.